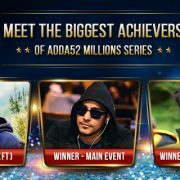 The biggest online tournament festival on Adda52.com this month was Adda52 Millions Series which took place from 26th to 31st July over the course of 6 days. 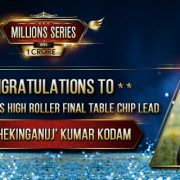 ..
Last Friday in Adda52 Millions Series saw the turn of Millions High Roller -6 Max, an INR 22K buy-in event with INR 20 Lacs in the guaranteed prizepool .. 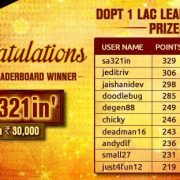 The recently concluded Deltin Poker Tournament (DOPT) on Adda52.com saw amazing turnouts and massive prize pools being awarded across the 5-day series. ..